The 29th edition of Suicide Prevention Week focuses on a critical component of prevention: speaking up. To reduce suicide rates, it is important to open up both a one‑on‑one and a collective dialogue on the topic. Since suicide already receives extensive media coverage and features prominently in fiction and on social networks, the Association québecoise de prevention du suicide believes that it is important to answer the questions that many Quebecers have and offer guidance on how to talk about it. Visit howtotalkaboutsuicide.com for a wealth of information, discussion strategies and resources. 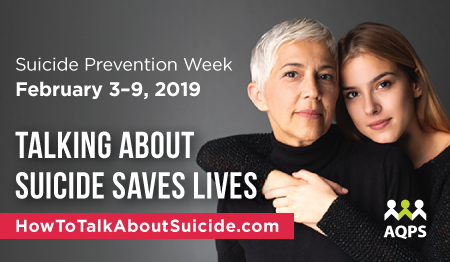 Have the courage to talk about suicide and suicide prevention with your loved ones, in your workplace and recreational activities. 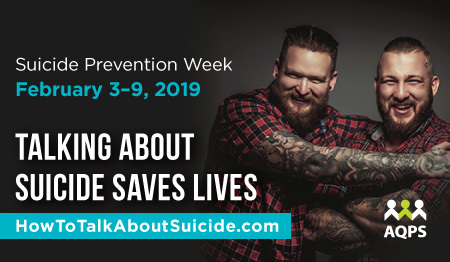 Invite employers to take an interest in mental health and suicide prevention and encourage them to implement concrete measures such as an employee assistance program or a gatekeeper network. Look for signs of distress in your loved ones and colleagues and do not hesitate to lend an ear and your support.